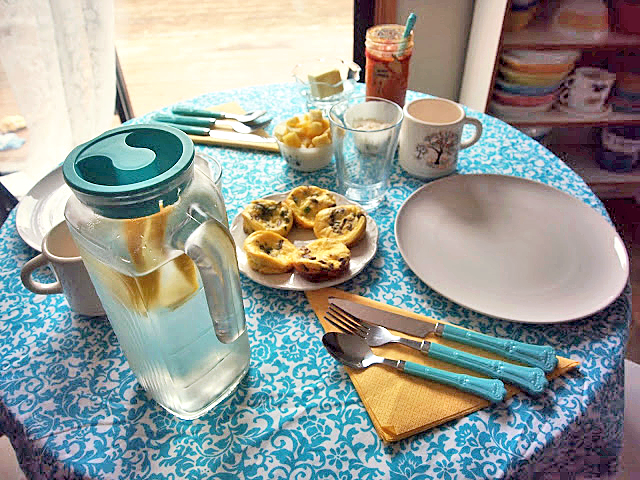 New Wave Domesticity: A Lovely Gluten-free Brunch : Coconut Pancakes & Crustless Mini Quiche! 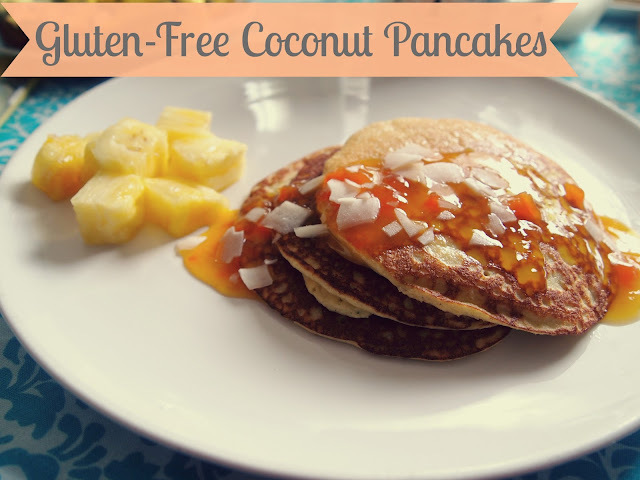 A Lovely Gluten-free Brunch : Coconut Pancakes & Crustless Mini Quiche! My friend Krissy (of Ponyboy Press & Plain Language Marketing) came over last week for a lovely spring brunch date. She has recently went gluten-free, so I wanted to challenge myself to create something special for her. I picked up some gf coconut flour from the bulk section of Winco and I was really excited to work with it for the first time! It is very different than traditional flour, it absorbs liquid much quicker and needs a bit of help to get to the right consistency, but it ended up making some absolutely delicious pancakes! I also made some mini quiches (because everything is better in miniature!) that took advantage of asparagus season and also allowed me to make them up ahead of time. Krissy brought these beautiful strawberries filled with lavender & black pepper cream cheese! They were amazing and elegant and you should definitely go to her site and get the recipe! Beat eggs with milk & cream. Add remaining wet ingredients & then slowly incorporate dry ingredients. Blend until you have a nice batter that can spread on it's own. It will be a little thicker than a traditional pancake batter, but that is just fine. You can add a bit more milk until you have the consistency you like. Using an icecream scoop, portion batter onto a hot oiled skillet. Give the skillet a bit of a turn (as you would with crepe batter) to help the thick batter spread more evenly. Cook for a few minutes per side until both sides are browned. Top with your favorite toppings! I was lucky enough to have some amazing mango topping from the Portland Preservation Soceity canning swap and it was heavenly! I also added some roasted coconut chips from Trader Joe's, but they would also be lovely with agave, jams or plain old maple syrup. Preheat the oven to 350 degrees & grease a muffin tin with butter or oil. Saute asparagus & mushrooms in a pan with a bit of oil until they soften up (don't cook them completely since they will still be going in the oven) - about 5 minutes. Beat eggs, cream, & salt in a bowl or an electric mixer. Cut the goat cheese into small pieces. Assmeble quiche by dividing your vegetable mixture evenly into each cup of the muffin tin (about 1/2-3/4 tablespoon per tin), cover with egg mixture so that the tins are about 2/3 full, drop a few peices of goat cheese into each one. Bake for about 20-30 until the middle of each quiche no longer has any jiggle to it. This is a really great simple recipe because it can be altered to fit your tastes & it is also great to make ahead of time. I cooked the quiche up the night before and then put them in the fridge so I just had to get them reheated in the oven before my guest arrived. These would also freeze really well to have a special pre-portioned breakfast waiting for you any time you need it! I really love being able to spend these lovely spring afternoons with the amazing people in my life and putting together a perfect table and meal for them just makes my heart soar. 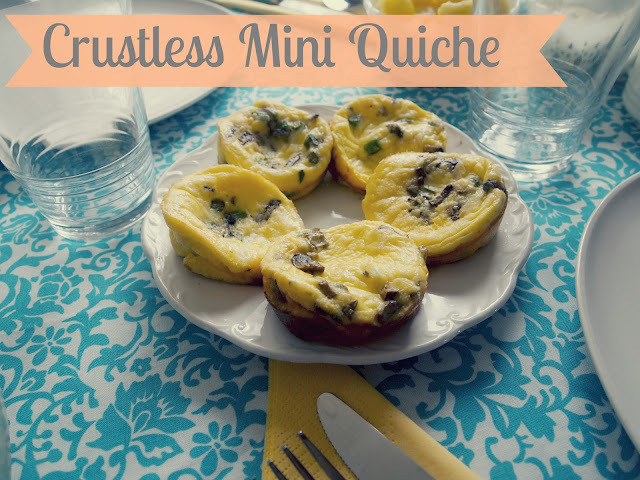 The crustless mini quiches sound a-mazing! YUM!